Thursday's update anticipated we would see another wave down in SPX before rallying higher, but it was not to be. I'll be frank: I feel like I haven't been that fooled by a near-term wave in a long time. Although I did mention that "For whatever reason, there's something bothering me ever so slightly about the impulsive appearance of this decline, but I can't put my finger on it, so it may be nothing." I essentially ignored whatever was bothering me, and ran with the idea that another near-term wave down was forthcoming. As it turned out, I should not have ignored my gut. 1. Because there was no sustained breakout over 2109, Thursday's downside targets still had a shot -- IF we got an expanded flat. I mentioned this on the chart, as follows: "Sustained trade north of 2109 would call the downside targets into question, but not entirely eliminate them, due to expanded flat potential. Nevertheless, bears should play it cautiously if 2109 is claimed." 2. 2109 was indeed claimed, meaning bears needed to be cautious from that point forward, because the break of 2109, however small, technically invalidated the possibility that the leg from 2108 down to 2074 was impulsive (impulsive waves cannot be retraced in excess of 100%, or they're not impulses). As it turned out, 2109 did function as near-term resistance, and bears were rewarded with a decent little decline, amounting to a 57% retrace of the prior rally wave (down to 2089). This at least afforded anyone who shorted 2109 the chance to exit with a small profit, or the chance to move stops to break-even. It pays to remember that C-waves are always corrective waves, and a corrective wave is always 100% a counter-trend play. A counter-trend play at a high enough wave degree (for example: the market's declines over the last year or so) can be very profitable. 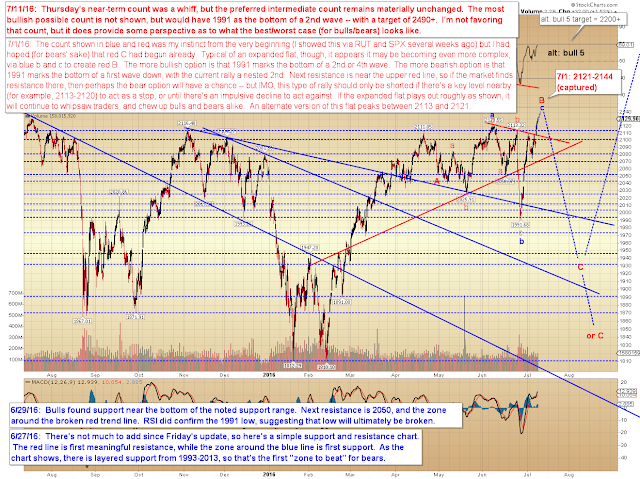 At near-term time frames, though, counter-trend plays require traders to be very nimble. One of the market's rules is that surprises are almost always in the same direction as the prevailing larger trend. For that reason, I would advise newer traders to avoid near-term counter-trend plays entirely (not trading advice! ), and to trade only in the direction of the larger trend. I know what you're asking and why you're asking it... but prefer not to try and anticipate where such waves will begin (at least, not as a trader; as an analyst, sometimes) -- as I said on the chart, I prefer not to front-run these types of moves unless there's a clear level to act against and/or an impulsive decline to act against. I'll identify some inflection points (the ATH and 2144ish being two), but we can't worry too much about "when will this end?" from here. Here's one reason why: The first place you look for a C-wave to end is the 1.618 extension (presuming we're in C-up to be followed by a larger degree C-down)... but they can also end at 2.618 extensions, and nobody in their right mind wants to take that much drawdown. So, I might short the 1.618 extension with a tight stop, but I'm not going to keep holding if it runs through my stop. If it stops me, then I HAVE to wait for a clear impulse at SOME time frame before trying again. Otherwise I'm literally just trading randomly. And we all know how that always ends. Here's another reason: What if it's not a C-wave? Even an 80% probability is still going 100% against you 20% of the time (yeah, I know: insert "Anchorman" clip here). So we have to account for the 20% by staying nimble and not stubborn -- otherwise 20% of the time we're just shorting into a bull move and we'll get murdered. That's why it's so important not to take the market personally. The BEST trades on the planet go 100% wrong sometimes, and they always will. There's a time to cling to a position... for example: You get a great entry with a 3-point stop and the market drops, you don't take an exit -- then it makes a "bullish looking move," but stays below your stop. I might want to cling stubbornly unless and until my stop is hit. But that's ONLY if I got a good entry. I won't do that if my entry is bad -- because to cling stubbornly to a bad entry means devastation if the market goes against me. To my way of thinking, the rule is, if you take a bad entry, then you have to stay nimble. That's the price of admission on a bad entry. You have to let the market shake you if it wants. That's the trade-off, and I know that going in. If I get lucky, then the market runs in the right direction to support my bad entry and I end up in profit. If I get stopped, then I just have to wait for the pattern to tell me when there's a good entry point. But if I take a bad entry and hold on "no matter what," I invariably get slaughtered. The losses are too big when I'm wrong. It's almost like the market intentionally punishes us when we lack discipline. But really, it's not the market punishing, it's just how life works. 3: cling to marginal trades stubbornly, and ultimately damage our accounts severely whenever the market goes against us, which it inevitably will at times. The middle ground, and the hardest ground to stand on, is trying to jump in and partake of a move that looks good. To do this, one is by definition taking a less-than-perfect entry (ideally, at least, near a minor inflection point). But if one chooses to do that, then one has to realize that they're on shaky and potentially dangerous ground from the very beginning, and protect themselves accordingly. A bad entry and/or an ambiguous wave is the wrong time to be stubborn, unless you're fully prepared to take a massive loss. A clear wave and a good entry is the only time I want to be stubborn. So, to wrap it up, the rally ends when it ends. I'll try to get a good entry when that moment comes, but I won't fight it if I'm stopped. Because: What's a good entry against the current rally? 2130? 2144? 2200? 2500? We won't know for sure until it's in the rear-view mirror. That's why we have to find places to define our risk. Besides, we don't want to be in a mindset where we're exclusively looking for short entries -- maybe short is the wrong trade entirely. And we can't find what we're not looking for. As an aside: The whole slate has to be wiped clean the minute you're stopped -- the next trade is not "another attempt to short this pig," it has to be thought of as an entirely new trade (albeit I sometimes even communicate in "taking another crack at a short/long" -- but I'm not thinking of it as a continuation trade, it's a new trade that happens to be in the same direction as the last trade). Otherwise one gets into a mindset of revenge trading and fighting the market. The market always wins that battle. We have to start over from zero each time because we can't think clearly otherwise -- we can't spot new opportunities if we're only looking to find a slightly-different version of the "opportunity" we were just stopped on. Maybe the next trade we make should be a LONG entry, but we'll miss that if we're always thinking the next trade is just a "continuation" ("I'll short this pig again later!") of the prior trade that was stopped. Vice-versa for bulls -- that's why bulls tend to buy the whole way down, while bears tend to short the whole way up. It's all viewed (consciously or otherwise) as part of one giant trade with no end. Each trade has to have a defined ending. Think of each trade as a roulette spin: The ball lands, the wheel stops spinning, the dealer collects money from the losers, and pays money to the winners. The next spin/the next trade is an entirely new bet. EVERYTHING that happened before that is gone, done, finished, over -- for better or for worse. If we approach the market any other way, then we end up in a game without end and no way to define our risk other than "losing it all or winning it all." Well, we'll never win it all. So that only leaves one option. This ended up being a lot longer than I intended, and I ended up on a few more topics than I'd intended. Hopefully there's some random thought of value in there, but of course NONE OF THAT IS TRADING ADVICE. In conclusion, the pending break of the all-time-high is a significant technical milestone, and means that everything that's unfolded over the past year is corrective. In a perfect world, bears will have a shot at a decent intermediate counter-trend play, as shown on the chart above. But keep in mind that, as of right now, anyway, any pending decline is expected to then resolve with even more all-time-highs. In other words, as of this moment in time, the bull market still appears to be unfolding. Trade safe.